I love cooking fussy dinners when I have the time and energy. There’s something meditative and satisfying about standing at the stove methodically stirring until a risotto transforms. That said, I rarely have the time, energy, or desire for said meditative and satisfying stirring. Most nights I’d rather whip up something quick and relatively healthy, preferably involving copious amounts of cheese, so I can make it back to Guy’s Grocery Games before the commercial break is over. 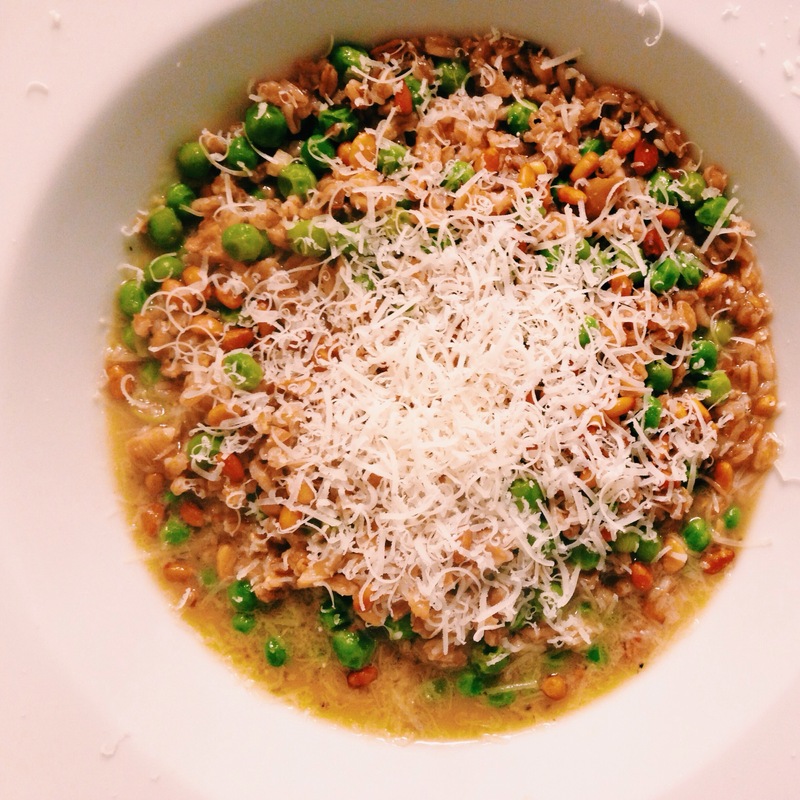 Enter: Cheater’s Farro Risotto. The whole thing cooks up in about 20 minutes (with a little more time up front that involves nothing more than boiling a kettle of water). I use quick-cooking farro instead of Arborio rice here, because it’s higher in protein and fiber, and as the name suggests, cooks up quickly. Have you heard all the buzz about ancient grains? Yeah, I don’t get it either. Rice is old as hell, too. Moving on. First you have to make your broth; this is a two-for-one deal. Soak 3/4 cup of dried wild mushrooms in 4 cups of boiling water for 30 minutes while you put your feet up and enjoy a contraband pregnancy diet coke. After 30 minutes, strain the liquid into a bowl. Feel free to add some leftover chicken or vegetable stock or concentrate to gussy it up. Let it simmer in a lidded pot on the back of the stove while you get everything else rolling. Chop the soaked mushrooms into bits. Sauté in a heavy-bottomed pot (I use my Dutch oven for almost everything) in some olive oil, butter, salt, and thyme. Give it a couple of minutes, and then transfer to a bowl. Add a little more olive oil to your pan and throw in a small, chopped yellow onion. Let that hang out for a couple of minutes, and then throw in some minced garlic. I also added some thyme and crushed red pepper. Season with salt. At this point, you can add those ‘shroom bits back into the mix. Your house now smells amazing. 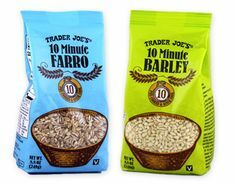 This is where the shortcut comes in: Trader Joe’s 10-minute Farro. Throw the farro in the pot and let it get all cozy with the mushroom and onion mixture. I like to think it’s “toasting up” a bit and absorbing some of that earthy, shroomy flavor. After a minute, add a ladle of simmering broth, and stir until it’s absorbed. Keep doing this risotto-style cooking (one ladle at a time, though you don’t really need to stir all that much) until you’ve got all your broth in, and it’s creamy but still loose, about ten minutes (long enough for one full game of iPad Jeopardy). The farro should still have a bite to it. Right at the end here, to send it straight over the edge, add in a cup of thawed green peas, a big nob of butter, and a (very) generous grating of parmesan cheese. Adjust your seasoning if you need to. 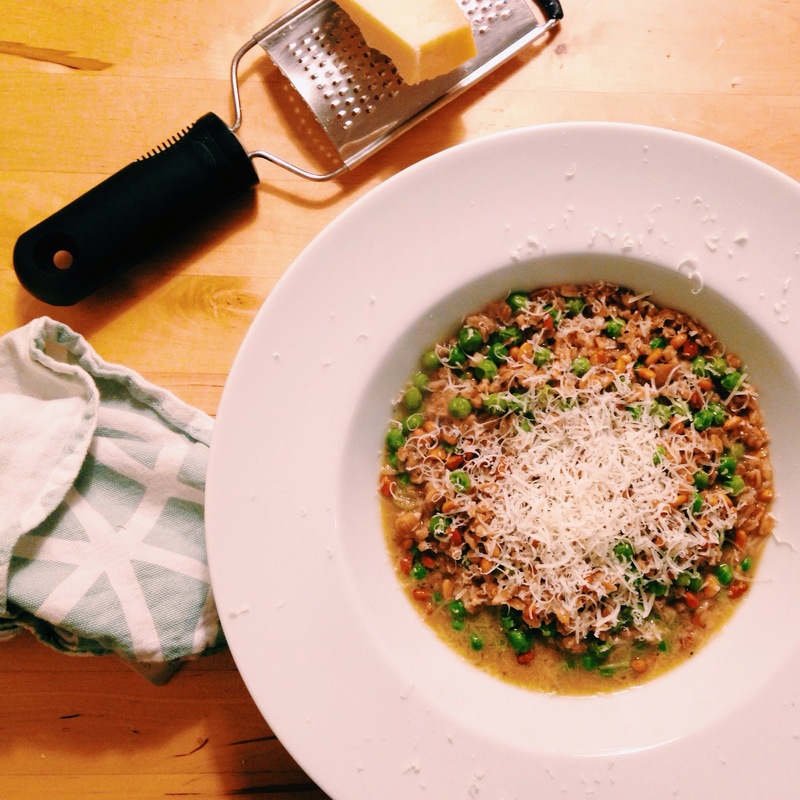 Serve in big bowls with more parmesan at the table. My husband got a big, fat pork chop nestled on top, but it’s really pretty spectacular just on its own.